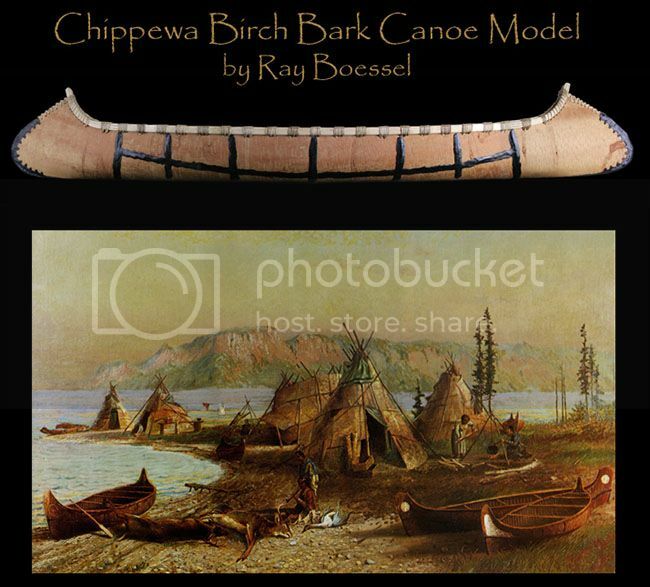 Ray Boessel Junior has graciously donated one of his Chippewa-style birch bark canoes as an auction item for the 2013 CLA show in Lexington. It is a scaled down version (model) of the larger size he makes at his canoe shop in Northern Minnesota, near the Big Fork River. It measures five feet long and almost a foot wide. The materials in its construction are the exactly the same as his large canoes. White birch bark is used for the hull of the canoe with the various pieces stitched together with spruce roots that have been split for that purpose. The stitched seams are then caulked. The ribs, thwart risers and gunwales are all made of white cedar. Ray Boessel began building bark canoes in 1981 after being taught the craft by his wife Christy and her grandfather, Bill Hafeman, who produced canoes from 1921 to 1983 through the name of Hafeman Boat Works. Bill and Ray have both received national attention about them and their craft. Bill was a nationally known and respected bark canoe builder and in 1982 was interviewed by Charles Kuralt and featured on the CBS evening news, “On the Road with Charles Kuralt”. In 2008 Steve Hartman did a follow-up on that story for CBS Evening News, focusing on Ray with this segment. In the meantime Bryant Gumble also did a special about Ray on the NBC Today Show in 1994. Over the years, Ray has made over 325 full size birch bark canoes, two 26 footers and one twenty footer that went to the Milwaukee Public Museum. Of the scaled-down models, Ray said, “I have made at least 100 of them.” Ray makes a number of different canoe styles, but the most popular are the Chippewa style which is identified by the “C” shape of the stern the bow and the Algonquin style, identified by a straighter bow and stern profile. Ray has also built Maliseet and Tetes-de-Boule styles.